Try out Bali's challenging track to get your adrenaline pumping! Combo package of ATV and Ayung River Rafting is also available in Klook! Absolutely amazing to drive this ATV quad bike!! The route is well designed for beginners or anyone who has no driving licence at all. There are rice terraces, mud road with mud water along the ride. Stunning views and incredibly fun!! Recommend couple or family with teens/kids to ride on one ATV together as strong power is required to control the ATV while driving. 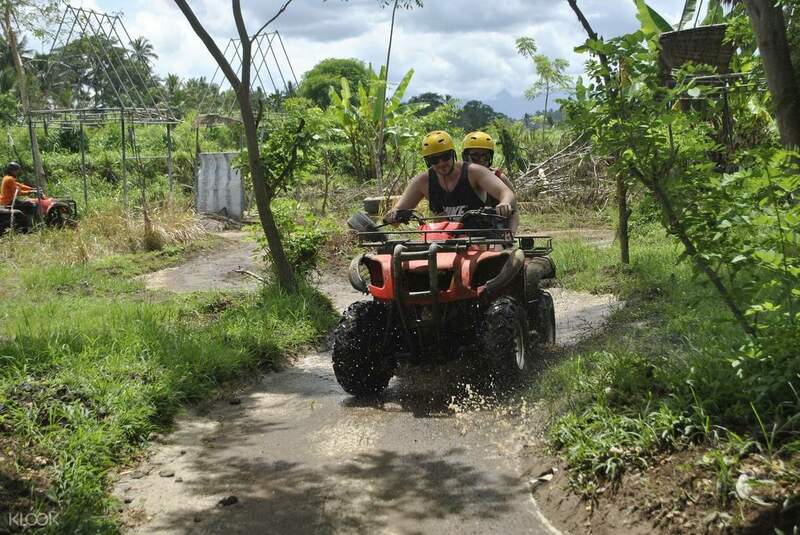 Explore this tropical paradise as you discover its varied landscapes, lush rice paddies, overgrown jungles and rushing rivers on a two hour ATV Quad bike adventure. Experience a convenient pick up at your accommodation, and whether you take a morning, afternoon or early evening ride, you will be given a thorough safety briefing and all the equipment needed for a safe journey. 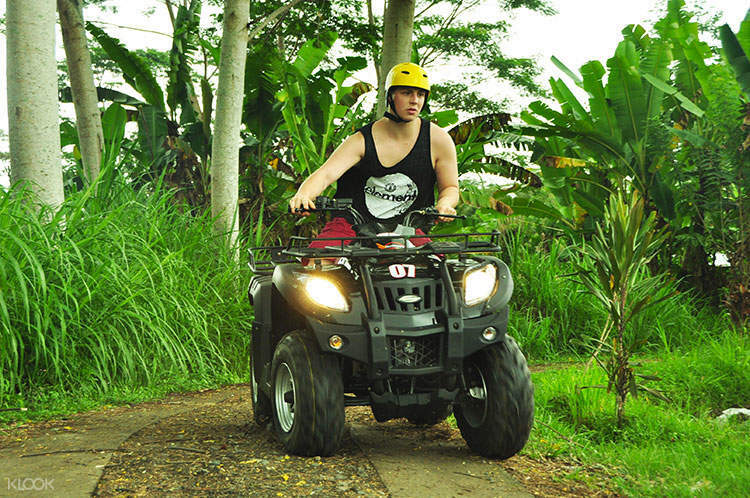 Choose to either ride in tandem with a companion or drive your own buggy each - either way, you'll be treated to a spectacular sight of Bali's natural beauty as you drive through and around the extensive track. If you're up for a bit more thrill, just let your guide know and he'll take you to a more technical terrain where you can make your way up steep hills on full speed or slide down slopes as you please. After an exciting ride, freshen up with a relaxing shower before feasting on a buffet meal of scrumptious food. Before you know it, you'll be dropped off safely in your hotel to enjoy the rest of your day. we love it a LOT! our driver was punctual and friendly. when we arrive the staff great us nicely. the ATV was really great, the staff also help us if we had difficulty in driving ATV(since it is our first time). the track was amazing, the rice field is amazing (and make the whole trip really worthed) ... we love it a lot. the lunch also quite nice. if only we had more time..we would like to combine with Rafting. hehehehe.. we love it a LOT! our driver was punctual and friendly. when we arrive the staff great us nicely. the ATV was really great, the staff also help us if we had difficulty in driving ATV(since it is our first time). the track was amazing, the rice field is amazing (and make the whole trip really worthed) ... we love it a lot. the lunch also quite nice. if only we had more time..we would like to combine with Rafting. hehehehe..
Best Quad Bike adventure ever experienced, fantastic track, very challenging, great day out, so much fun, great pick up drop off service, and lovely meal. Best Quad Bike adventure ever experienced, fantastic track, very challenging, great day out, so much fun, great pick up drop off service, and lovely meal. Definitely enjoyed the rides through all terrains - wet, muddy, bumpy ride through the rice fields and villages. Worth the experience. Wasn’t too tough but expect blisters on your palm. Would suggest you to bring your own gloves as they only provide boots and helmets. Lunch was okay. Pick up was on time. Overall enjoyed my time there! Definitely enjoyed the rides through all terrains - wet, muddy, bumpy ride through the rice fields and villages. Worth the experience. Wasn’t too tough but expect blisters on your palm. Would suggest you to bring your own gloves as they only provide boots and helmets. Lunch was okay. Pick up was on time. Overall enjoyed my time there! It was an awesome experience. It was my first time and I wanna do it again in the future. It was an awesome experience. It was my first time and I wanna do it again in the future. Thoroughly enjoyed the experience. The pick up from our hotel was on time and the driver (short name was Putra) was lovely and entertaining. We reached the location and didn’t wait too long before getting on the bikes. The landscape were beautiful and so were the people we met along the way. The terrain was challenging which added to the excitement. The only issue we had were with the bikes as my husband had to stall multiple times due to a defective chain on his bike and lost a bit of time there. Thoroughly enjoyed the experience. The pick up from our hotel was on time and the driver (short name was Putra) was lovely and entertaining. We reached the location and didn’t wait too long before getting on the bikes. The landscape were beautiful and so were the people we met along the way. The terrain was challenging which added to the excitement. The only issue we had were with the bikes as my husband had to stall multiple times due to a defective chain on his bike and lost a bit of time there. Great driver name Beno . Made us really comfortable throughout the 1 hour drive. Instructor was really patience . It was really really funny . We love it sooo much ! awesome ! Great driver name Beno . Made us really comfortable throughout the 1 hour drive. Instructor was really patience . It was really really funny . We love it sooo much ! awesome !